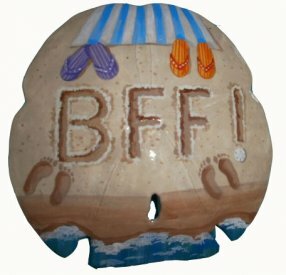 These are our hand-painted Sand Dollars with special messages for you, your friends and family, that are written in the sand in a whimsical fashion to bring a smile to whomever receives them as a gift. On the back is a special place to hand write the Date:,To:, From:, and Message:, which will make that ornament a traesured gift for years to come! Send these ornaments instead of a card with your message written right on the back....unique and heartfelt holiday or everyday greetings. They may also be displayed in a small easel as home decor in addition to being a traditional ornament. So give it a try! Be one of the first to send a SAND-O-GRAM!! !